We all know that space is about going really fast. We also know that what matters in a collision isn't really absolute speed, but relative velocity. (Two cars with matched speeds on a highway touching each other doesn't necessarily lead to large damage, but if one of them was standing still, it probably would.) A large fraction of the orbiting spacecraft are in prograde orbits, simply because it's easier and, if not actively helpful, at least doesn't hurt; that also reduces the relative velocity between the two. Yet people keep saying that in-orbit collisions happen at such extreme velocities. What is the typical relative impact velocity of a piece of orbital debris to an operational spacecraft in low Earth orbit? 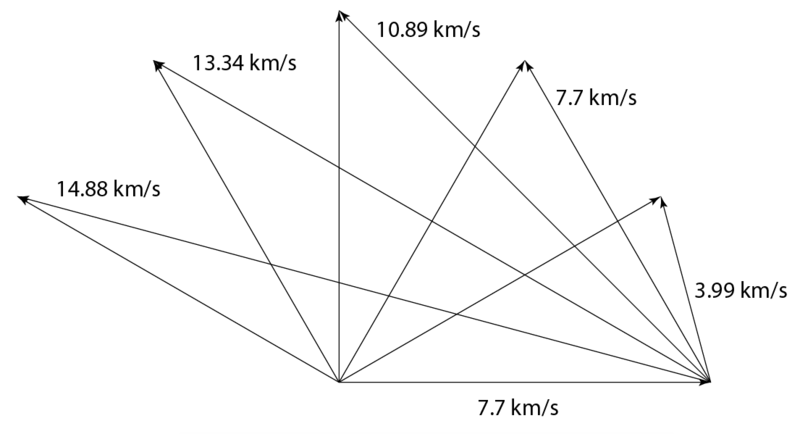 What are the vector component values of this velocity? Bonus points for answers that include citations. Also bonus points for answers that include the data from which the "typical" is derived. Take a look at this answer by Mark Adler. As you can see, a small panel over a 15 years endured many impacts. I would expect there have been multitudes of impacts over all. I doubt anyone knows what the average impact velocity has been. I'll attempt to give you some tools to examine different scenarios, though. where $\alpha$ is the angle between a and b. The Law of Cosines may look hard. 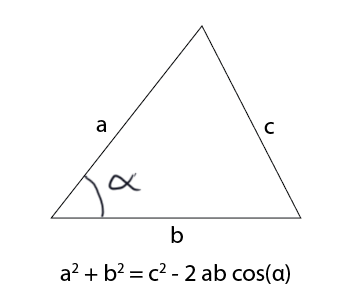 But if you remember cos(90º) is zero, you can see the Pythagorean theorem drop out when alpha is 90º. So if you just memorize the $-2 ab * cos(\alpha)$ part, the rest is the Pythagorean theorem you learned in high school. And when you do vector subtraction, the third side of the triangle is the delta v between the first two velocity vectors. Not sure how precise you need the answer, but just thinking about the first cosmic velocity and the escape velocity, it can only be a value between that. So Something between ~7.8 km/s - 11.2 km/s. Of course as you mentioned the relative velocity matters. The orbits of the debris could be opposed to the orbit of the spacecraft so the theoretical max relative velocity would be 11.2 km/s + ~7 km/s = ~ 18 km/s (since you're talking about a LEO and not a HEO or something). Since most launches take place in a prograde orbit I'd imagine that most of the debris would be in a prograde orbit as well so most impacts probably take place at a relative velocity of the perigee speed of a HEO (9-11 km/s depending on the orbit) and the speed of the spacecraft in LEO (~7-7.5 km/s). Worst case is about 19 km/s as mentioned before though. All speeds below that are possible though, as the inclinations between the spacecraft can vary, resulting in very different relative velocities. I calculated a simple example. Two objects are in a circular low orbit but in different planes. The impact velocity depends on the angle between the orbit planes. I use 7.8 km/s for the speed in orbit. For an angle of 5° the vectorial velocity difference is 0.68 km/s, for 10 ° 1.36 km/s, for 15 ° 2.04 km/s, for 30 ° 4.04 km/s, for 45 ° 5.96 km/s and for 90 ° 11.04 km/s. Two orbits with an angle difference of 45 ° to the equatorial plane in oppositional directions have an angle difference of 90 ° between them. Impact velocities of 1 to 11 km/s are possible. Not the answer you're looking for? Browse other questions tagged low-earth-orbit debris impact or ask your own question. How exactly does the inclination and direction (specifically retrograde) of orbit affect the velocity I need to attain orbit? What are the causes of breakups of spent 2nd and 3rd stages, resulting in orbital debris? What is the linear dimension/mass/possible energy state of the smallest trackable orbital debris item? If a cube or micro satellite could collect 1-2 cm space debris in Earth orbit could they be deorbited while raising the sats orbit? How can debris from an impact escape to a stable orbit?